I absolutely adore non-Americanized ethnic food. With so many other cultures' cuisines designed around wheat-free ingredients, ethnic foods are often a wonderful relief from the American staples of wheat, dairy, and all things processed. Although I have already posted an overview of Union Market and all of the gluten-free finds to be had there, I wanted to throw the spotlight on DC Dosa, one of the restaurants I visited while exploring the market. Started by Priya Ammu, a Bombay native whose dosas have accumulated quite a following over the years. Because her own family has dietary restrictions, Ammu has mastered the art of gluten-free, meatless cooking. The food offerings at her Union Market stand is entirely gluten and vegan, a true foodie oasis where all thoughts of cross contamination and accidental glutenings can be left behind. The array of offerings might appear to be limited, but the customizations opportunities are endless. 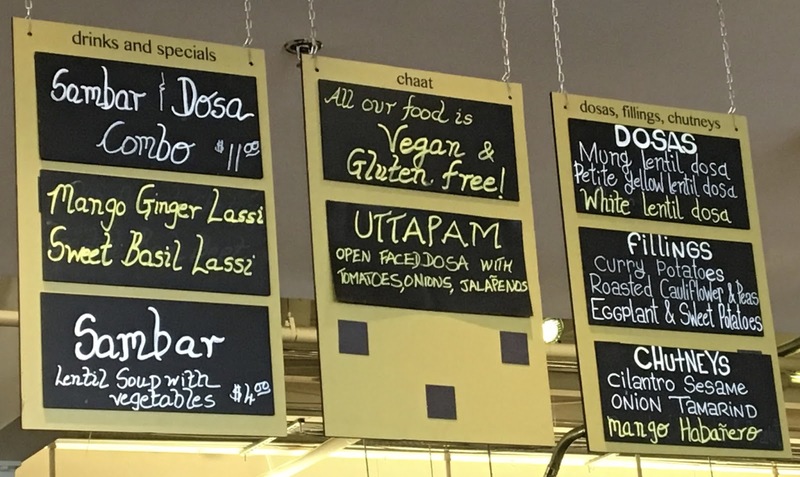 Pick and choose what fillings and chutneys you want with your dosa, add a soup, or pair it with a lassi (not dairy-free) to fill out the meal. Before going any further, I am sure you are wondering what exactly is a dosa. Made from fermented rice flour and lentils, dosas are basically the Indian version of crepes. 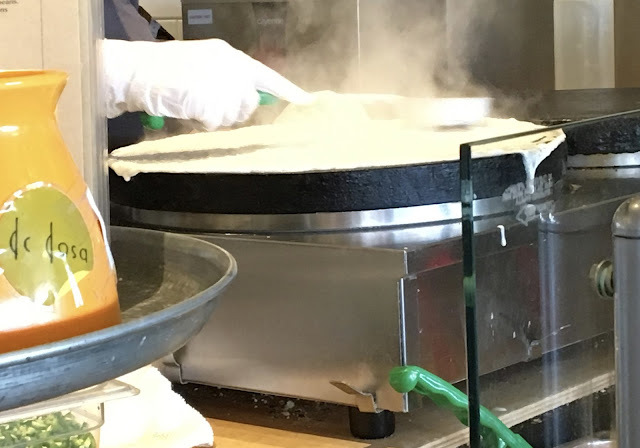 When you select which dosa base you want (top left corner of menu), the staff ladle it onto a hot pan which turns the liquid into a massive thin crepe. While the mixture is solidifying, I chose to add halapeno, onion, and cilantro, which added flavor to the finished dough. The finished dosa is quite large, so definitely consider splitting one with a friend, or finishing one off by yourself if you have a large appetite! My dosa was made with the white lentil batter. 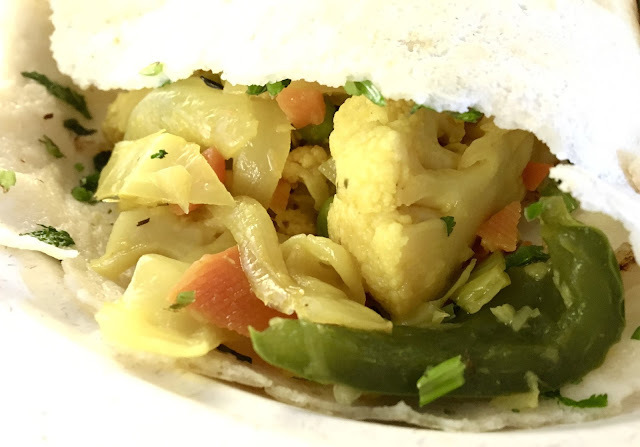 For vegetables, I chose the cauliflower and peas, and ordered the onion tamarind and cilantro chutney on the side. I loved the light and airiness of the dough, which was chewy, and when folded over itself, tasted like a savory pastry. Definitely don't skip adding onions and cilantro during the cooking process, because it really gave the dough a nice flavor. The roasted veggies I ordered as a topping were cooked beautifully to the point where they were soft, but still flavorful. Cauliflower, cabbage, peas, carrots, and other vegetables were included in medley. While seasoned, the veggies were not too spicy and were definitely delicious paired with the dosa. 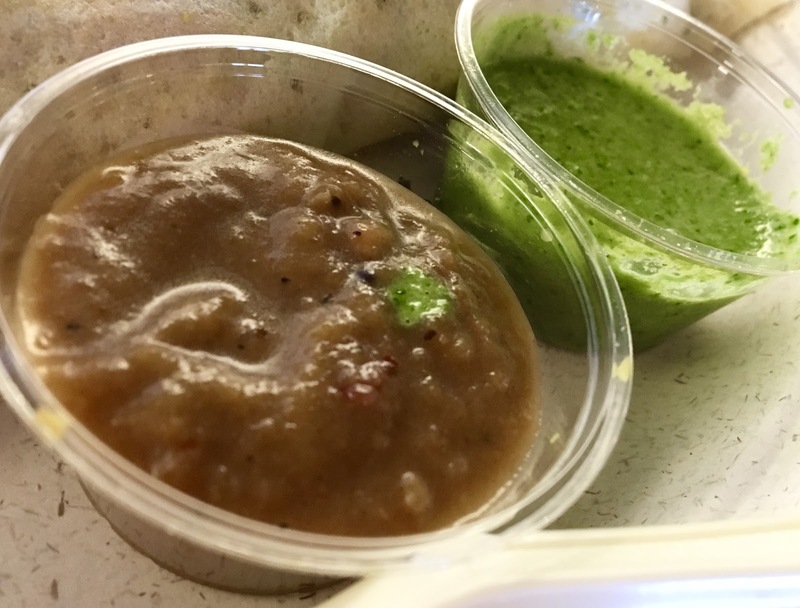 Of the two sauces, the one that stole my heart was the cilantro chutney, which was incredibly fresh and flavorful. Before the stand opened, I watched the DC Dosa staff washing bunches of fresh cilantro, whose flavor shines in this simple sauce. I poured it over the veggies and loved mopping up the rest with strips of the dosa. The onion tamarind had a nice caramelized onion flavor, but I am not too big on tamarind, so this one really did not do much for me. 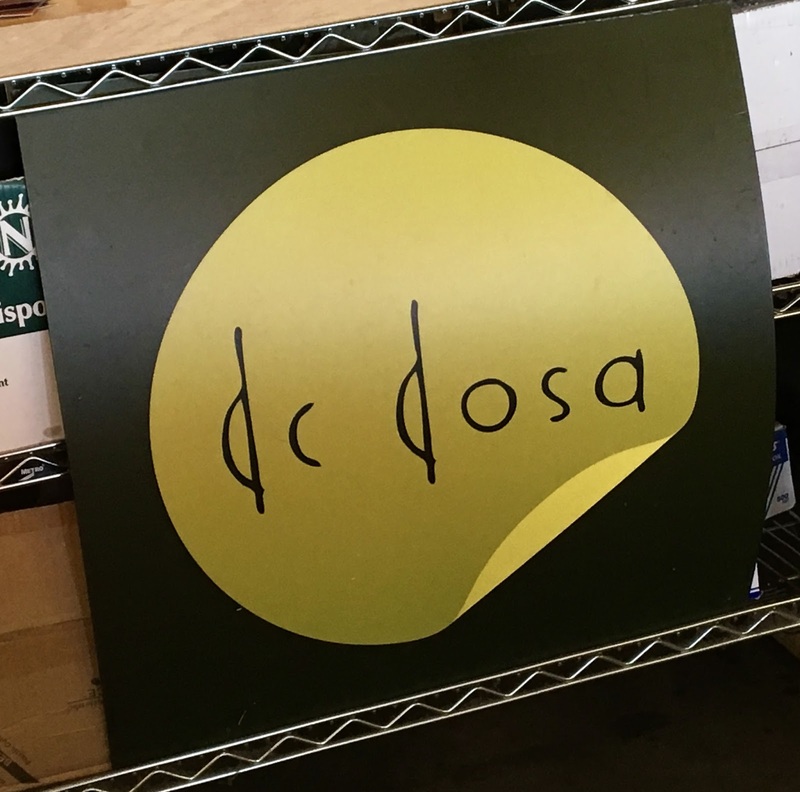 DC Dosa is off the beaten tourist track, but oh, so worth the adventure. I absolutely adored my dosa and the cilantro chutney, and appreciate that they are made in a dedicated gluten-free environment. 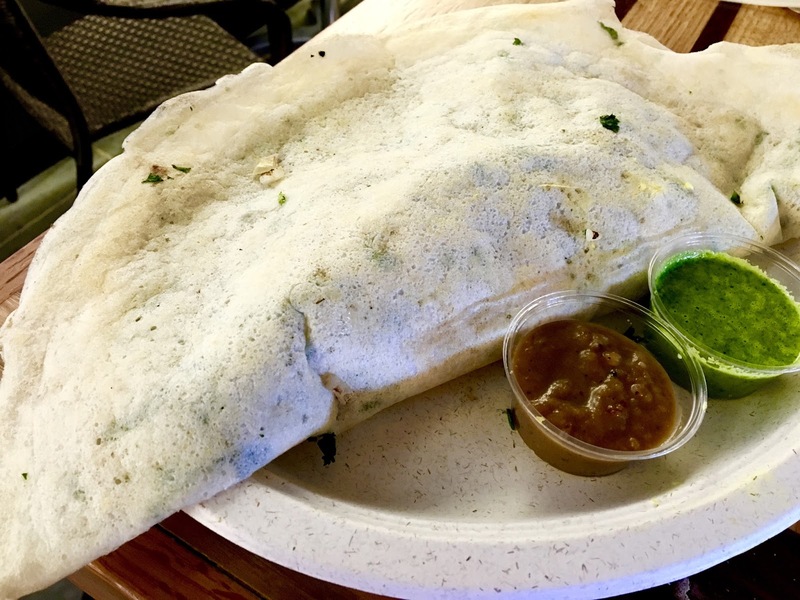 Although I am still an Indian food newbie, this DC Dosa definitely widens my horizons and will definitely lure me back for more someday soon. Locals and tourists alike- do yourself a favor and take the red line Metro up to NoMa/Gallaudet for a true foodie adventure.